HP sends yet another multimedia laptop dubbed Envy m6-1101sg into the race with the familiar aluminum casing. The 15.6-incher is delivered with Windows 8 as the operating system. 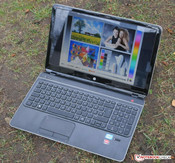 At a price of around 800 Euros (~$1063), HP's Envy belongs to the more affordable models of this price range. 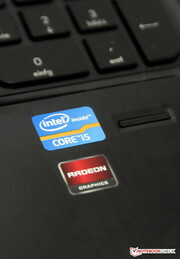 The owner of this laptop should not be a fan of computer games because the gaming performance is rather poor owing to Intel's dual-core i5-3210M (2.5 GHz) and AMD's dedicated Radeon HD 7670M. The buyer should not like working outdoors either since the 15.6-inch LCD screen is not AR coated. 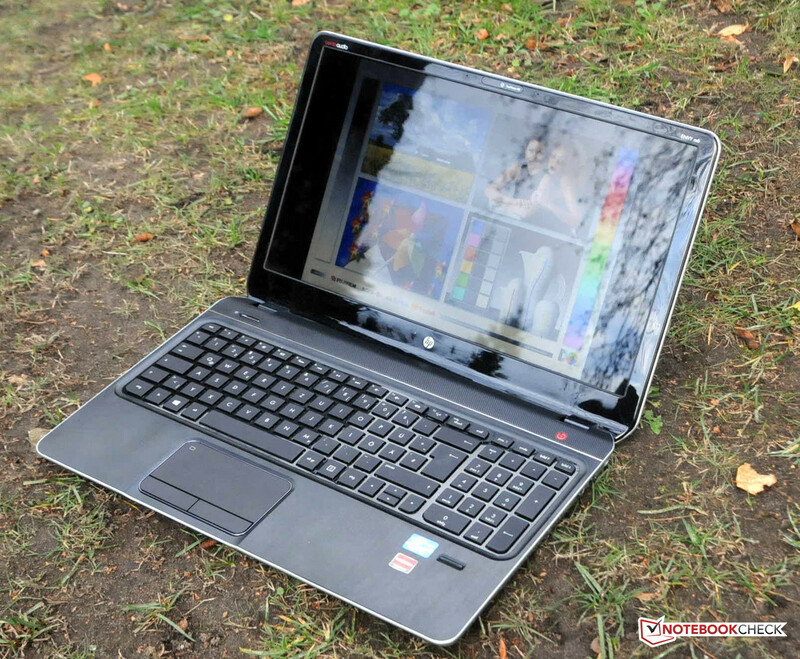 Find out in the following review which strengths and weaknesses HP's Envy shows. 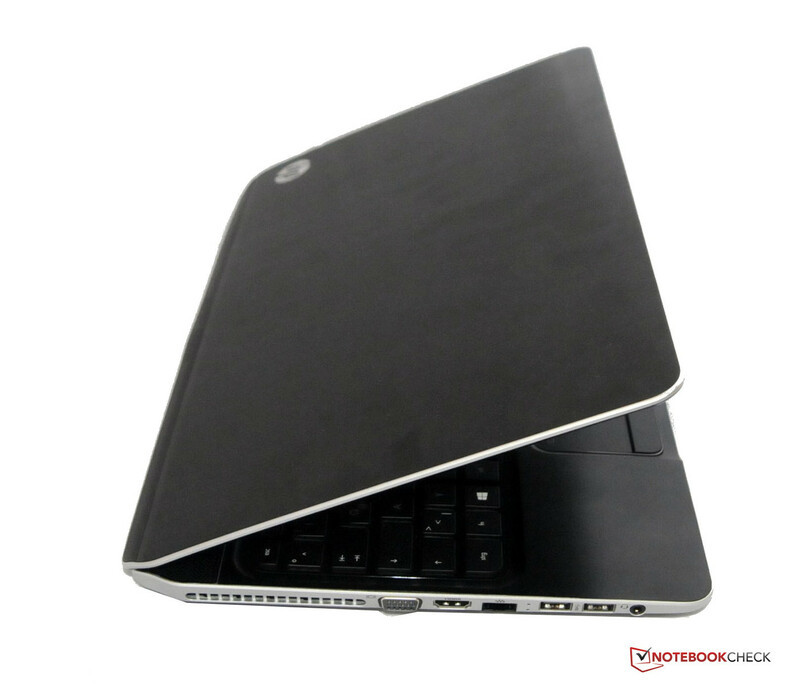 The casing of our test device is virtually identical with HP's Pavilion m6-1050sg sister model. HP's Envy m6-1101sg is only available in black. The casing of the 15.6-incher is comprised of aluminum and chrome. Regrettably, the known stability problems have been adopted from the sister model. The casing particularly yields toward the center when pressure is applied. It looks similar on the quite thin display lid. It warps easily and also yields extremely under slight pressure. The hinges also have room for improvement. They do not do their job very well. The display teeters quite strongly when it is adjusted. We noticed the quite large cover for the laptop's innards positively. Only one single screw has to be removed to open the maintenance cover. Swapping the battery is also very easy. We did not find any sharp edges or manufacturing flaws on our test device. HP's Envy weighs approximately 2.4 kg. 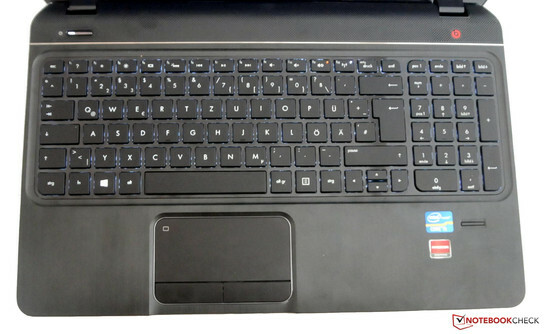 Compared with HP's Pavilion m6-1050sg, the connectivity has not been modified much. The customer can still be pleased about three fast USB 3.0 ports. The fourth USB port only supports 2.0. 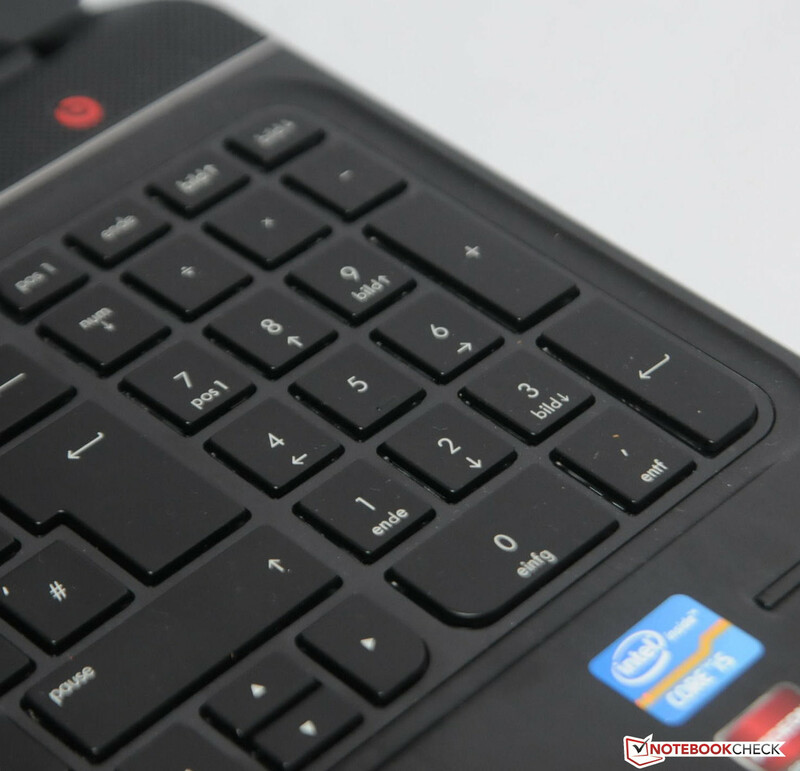 The fingerprint scanner was noticed favorably, as it is rather unusual in multimedia laptops. There is nothing wrong with the interface positioning for right-handed users. In return, the port distribution might prove to be a problem for left-handed users because a cable mess could develop. HP's Envy m6-1101sg sports the standard communication modules. Besides Gigabit LAN, wireless LAN in the form of Ralink's RT3290 (802.11n) is installed. Bluetooth is only available in the older 3.0 +HS version. In addition to the laptop and the corresponding PSU, HP does not include any accessories for the Envy. The manufacturer does not offer any specific accessories for this model on its homepage either. Hewlett Packard includes a two year pick-up & return warranty on its Envy. The warranty and the runtime can be upgraded for a surcharge. The manufacturer currently demands 105 Euros (~$139) for another year including pick-up & return. The customer has to fork out 236 Euros (~$313) for three years including accidental damage insurance. The manufacturer explains what it means with "accidental damage" on its homepage. 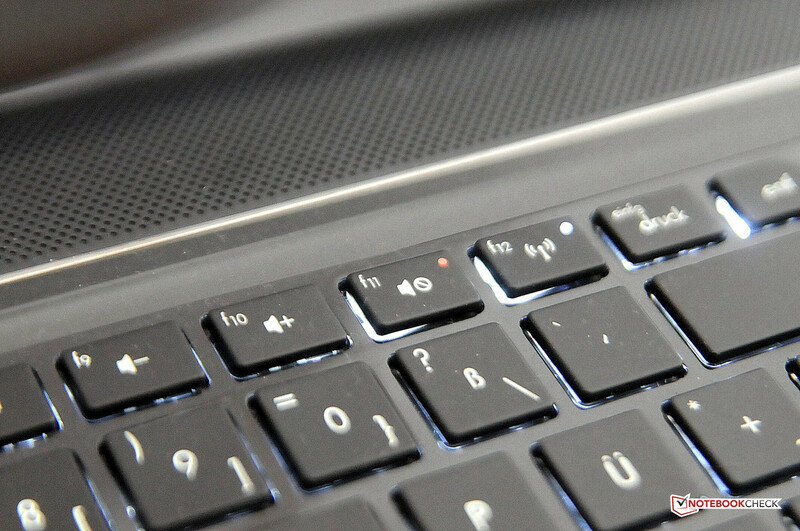 A highlight of the chiclet keyboard installed in HP's Envy m6-1101sg is definitely the backlight. Moreover, small LEDs on the Wi-Fi or mute keys indicate their status via light signals. The Pavilion m6-1050sg did not feature a backlight; otherwise the inputs are very similar. The black plastic keys feature white lettering and have a size of approximately 15 x 15 mm. 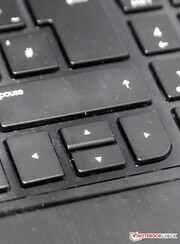 The keyboard exhibits a medium key drop and an agreeable pressure point. The typing noise is barely audible while working. The keyboard yields a bit toward the center, but that is not distracting. We have to criticize the too small up and down arrow keys. That will be particularly annoying for gaming fans. Otherwise, typing on the chiclet keyboard is very comfortable. The implemented touchpad was compelling in the test. It is placed in a recess which separates it from the rest of the work surface. Its sleek surface exhibits good gliding traits. Of course, the mouse replacement with a diagonal of almost 11 cm supports multi-finger gestures. These can be configured in the preinstalled software. The two dedicated keys feature a medium key drop and a clear pressure point. Their click noise is not distracting, like the keys in the keyboard. The touchpad can be turned on and off by pressing the upper left corner. The pad's activation state is also indicated via an LED signal. 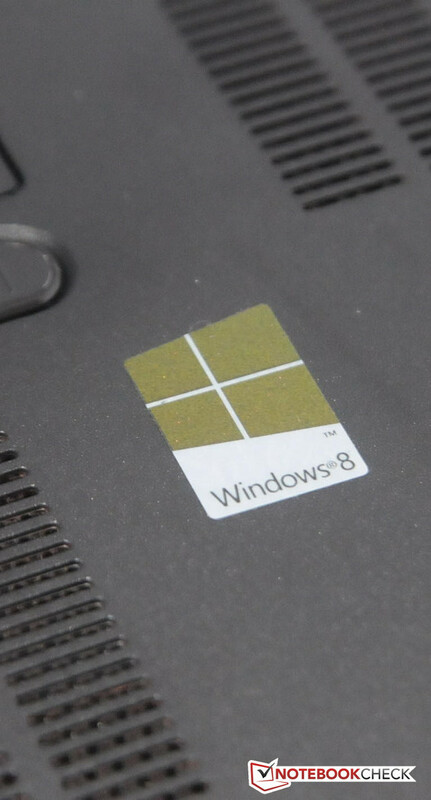 However, there are still a few problems with the mouse replacement in Windows 8. Like in the Envy dv6-7202eg, the pad turned itself off in a few applications (e.g. HWINFO) and could only be reactivated by rebooting the system. We can only hope for updates from the manufacturer in this case. HP relies on a 15.6-inch LED screen in its Envy m6-1101sg. The "HD BrightView" screen in the multimedia laptop manages a maximum resolution of 1366x768 pixels. The screen model CMN15B6 is not AR coated, which makes outdoor use difficult as is the same with its sister model. The customer gets a Full HD screen that is even AR coated in Asus' N56VZ-S4044V multimedia laptop for a bit more money. We first measured the 15.6-incher's brightness. Our test device only achieved a poor average of 200 cd/m². The aforementioned Asus model manages almost 300 cd/m². HP's laptop reached a maximum of 207 cd/m². At least the brightness distribution of 93% is quite homogeneous and the brightness is maintained on battery power. We measured a black value of approx. 0.35 cd/m² which results in an agreeable contrast of 571:1. Moreover, we compared the color spectrum with references. The multimedia laptop already struggled with the small sRGB color space. HP's Envy cannot completely cover it as can be seen in the screenshot below. However, this information will likely only be important for graphic designers and photographers. We tested the LED screen's outdoor suitability in a practical test. The rather poor brightness and the reflective screen are not good omens. The practical test confirmed our premonition. Text and pictures are difficult to recognize in sunlight. It is at most possible to work to some extent in the shade. Naturally, we did not forget to check the viewing angle stability. The result is not at all surprising. As is often the case, the image distorts severely when deviating from the ideal vertical angle, while the picture remains quite stable horizontally. We took darkroom pictures of the laptop from different perspectives using the same aperture and shutter speed. The photo montage illustrates the viewing angle stability. 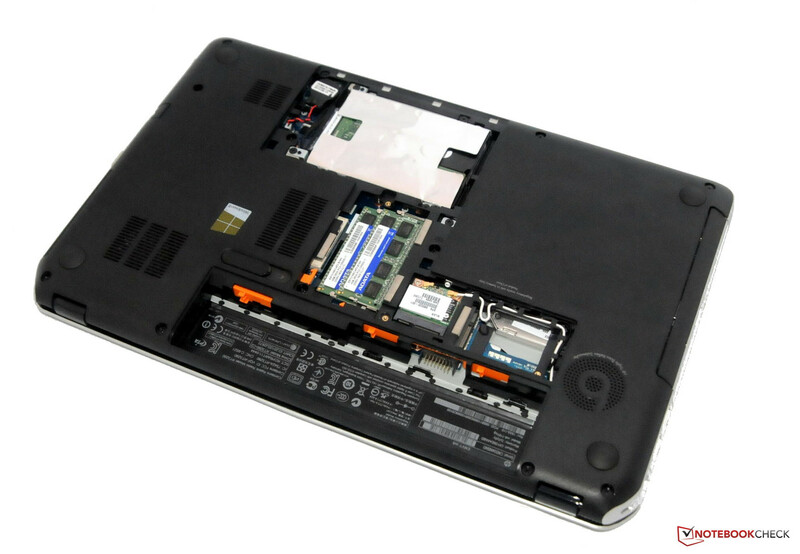 Intel's dual-core i5-3210M processor is the laptop's heart. 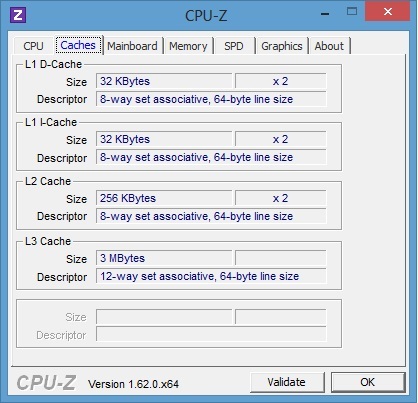 The CPU based on the Ivy Bridge architecture has a default clock of 2.5 GHz. When sufficiently cooled, the processor's clock can be increased to 3.1 GHz (1 core) for a short time via Turbo Boost. The processor's performance should be sufficient for demanding applications such as HD video editing. The i5-3210M should even be able to cope with up-to-date 3D games. The chip manufacturer specifies a thermal design power (TDP) of 35 watts. 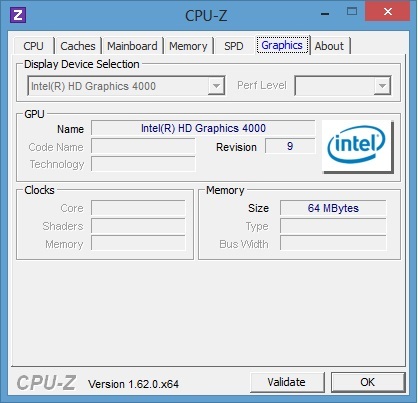 Intel's HD Graphics 4000 card is integrated in the 3210M processor. The performance of the integrated graphics card is 60% higher than that of the former HD Graphics 3000 according to the manufacturer. The processor-integrated graphics card supports DirectX 11 and Shader 5.0. HP's Envy also sports AMD's dedicated midrange Radeon HD 7670M graphics card. AMD's graphics card, with 480 Unified Shaders and 716 million transistors, features 2 GB of DDR3 memory. 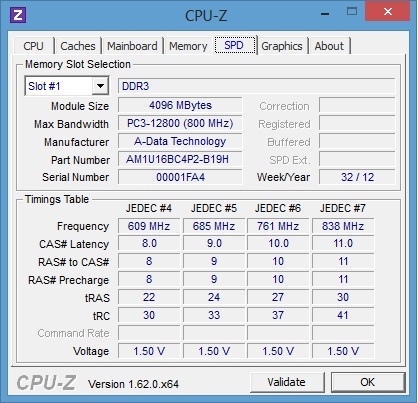 The dedicated graphics card's core clock is 600 MHz. Either the HD Graphics 4000 or the Radeon HD 7670M is enabled depending on the required computing power to save energy and extend battery life. 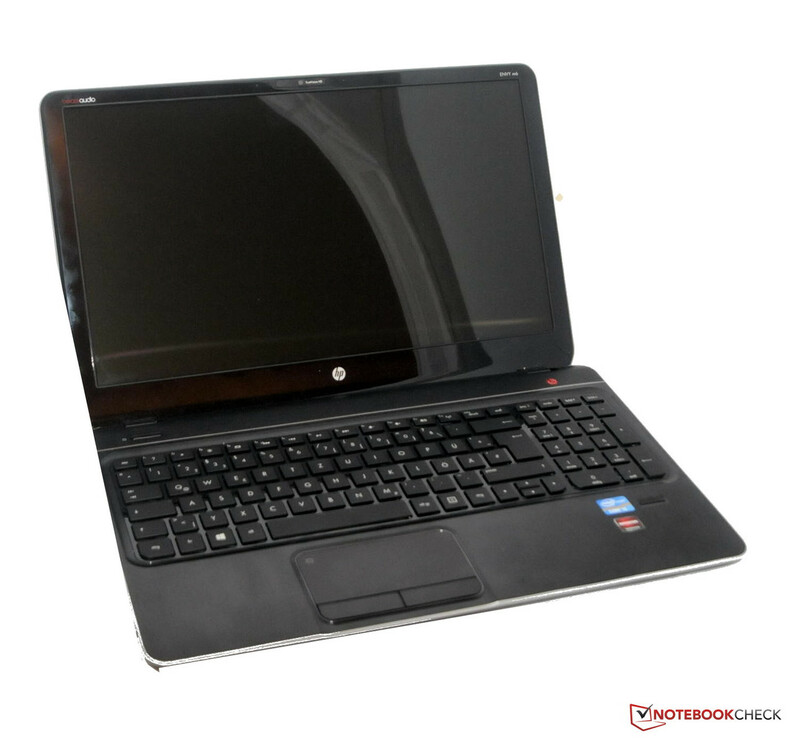 The user can fall back on an 8 GB DDR3 working memory in HP's Envy m6-1101sg. 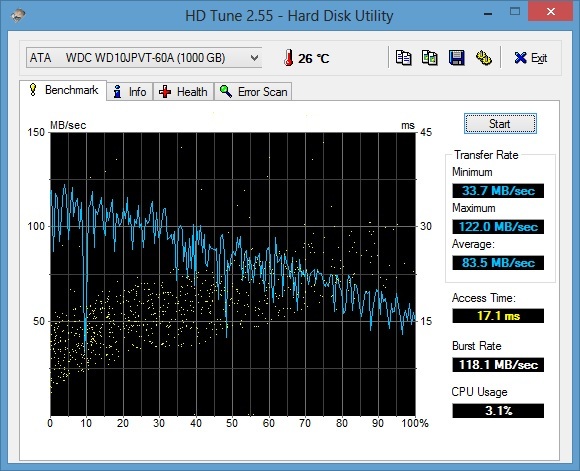 HP relies on an HDD from Western Digital. This hard drive spins at 5400 revolutions per minute and provides a storage capacity of 1 TB. We tested the dual-core i5-3210M's performance with Cinebench R10 and the latest version of Cinebench R11.5. Out test device achieved 4255 points in Cinebench R10's (32 bit) single-rendering test. For comparison, Dell's Inspiron 15R SE only managed 4149 points with Intel's quad-core i7-3612QM processor. The two additional cores in Dell's Inspiron 15R SE multimedia laptop first pay off in Cinebench R10 32 bit multi-rendering test. HP's Envy accomplished 8694 points in contrast to 15804 points achieved by Dell's 15.6-incher. 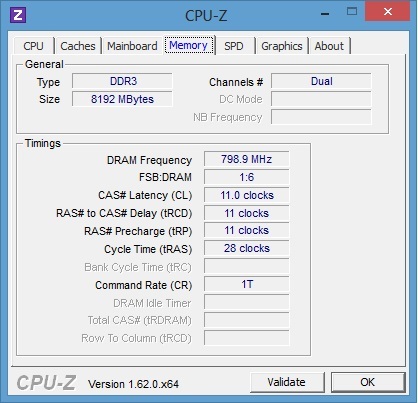 The CPU stably maintained a clock of 2.9 GHz during the tests due to Turbo Boost. The performance difference related to the two additional cores also becomes evident in Cinebench R11.5 (multi). HP's Envy managed 2.89 points here while Dell's Inspiron 15R SE achieved a 93% higher performance. Normally, we use PCMark Vantage and PCMark 7 for our system performance tests. Regrettably, PCMark Vantage is presently not supported by Windows 8 so we only have the latest version for our tests. Our test device reaped in 2392 points in PCMark 7. Consequently, HP's Envy is on a par with Dell's Inspiron 15R SE featuring an i7-3612QM processor and AMD's Radeon HD 7730M graphics card. Asus' N56VZ-S40444V with a quad-core i7-3610QM and Nvidia's GeForce GT 650M graphics card is only marginally better with 2505 points (+5%). The good total score is particularly based on the Computation and Creativity tests. The application performance is absolutely sufficient for routine tasks. Even picture and video editing should not be a problem for the 15.6-incher. 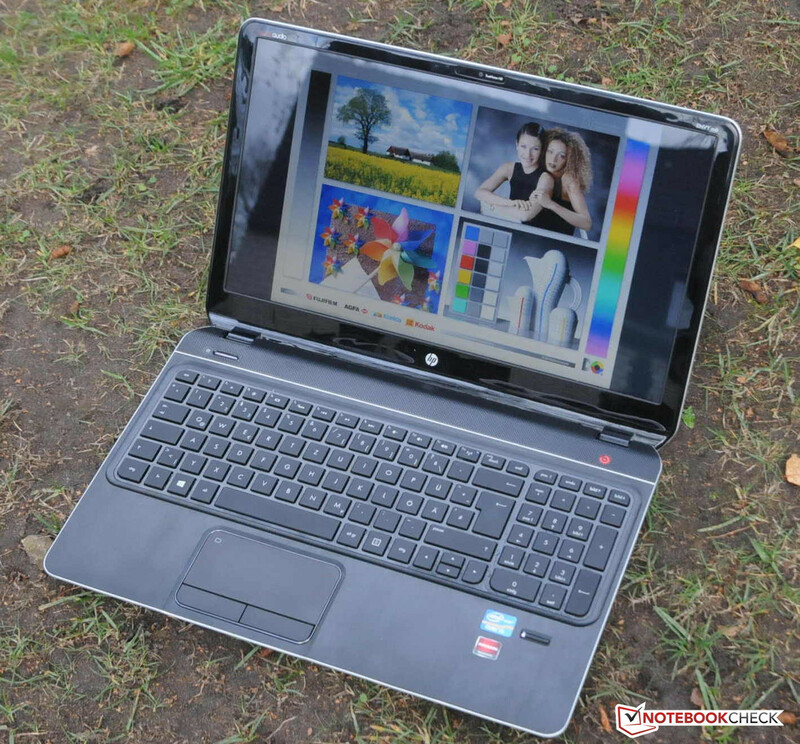 The user of HP's Envy m6-1101sg has a lot of storage space available. The manufacturer opted for an HDD with a capacity of 1 TB from Western Digital. The hard drive only spins at 5400 revolutions per minute. However, the performance is quite good for a 5400 rpm hard drive. We ascertained an average transfer rate of 83.5 MB/s in the test. The access rate of 17.1 ms is also good. The system would certainly be faster with an SSD. However, this cannot be expected in this price range. Even a 7200 rpm HDD could present a performance boost. An example for this would be Samsung's 550P7C-S02DE featuring Hitachi's Travelstar 7K750 HTS727575A9E HDD that achieved an average transfer rate of 96 MB/s in HDTune. It is possible for the user to replace the hard drive because the innards are easy to access. 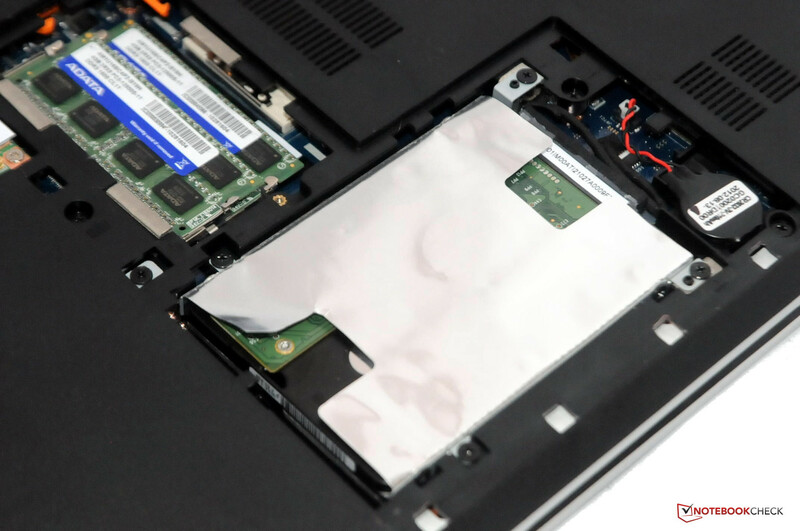 More information about hard drive performance can be found in our special article. AMD's DirectX 11 capable Radeon HD 7670M graphics card is employed when a higher graphics performance is demanded. We use Futuremark's known 3DMark series for analyzing the performance. The 15.6-incher achieved 5028 points in 3DMark Vantage. Dell's Inspiron 15R accomplished 7002 points (+39%) using AMD's Radeon HD 7730M in this test. 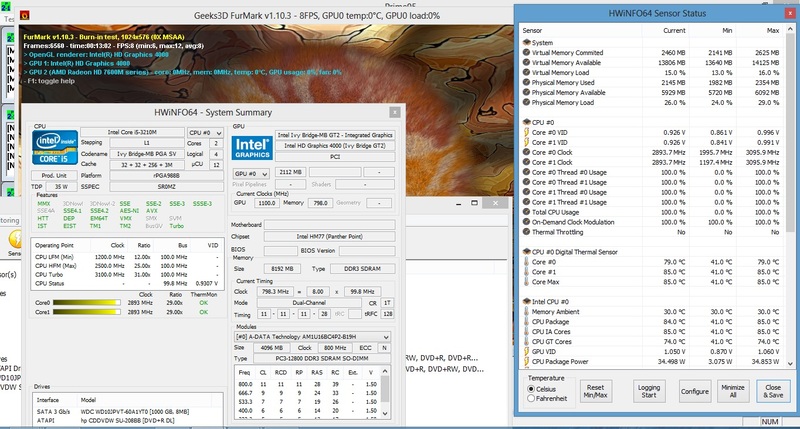 Dell's model also has the lead on HP's Envy m6-1101sg in 3DMark 11. However, the performance difference is now only 32%. Compared with an Nvidia graphics card, the performance of our test device is on a par with Asus' K55VM-SX064V featuring a GeForce GT 630M (1288 points). The performance difference is noticeable 87% in the approx. 200 Euros (~$265) more expensive Asus N56VZ-S4044V with Nvidia's GeForce GT 650M. The 15.6-incher with AMD's Radeon HD 7670M is clearly inferior here. It was possible to play Mafia 2 and the rally simulation Dirt 3 in high details and a resolution of 1366x768 pixels on HP's Envy m6-1101sg multimedia laptop. A game should run with at least 30 frames per second for a smooth gameplay. However, smooth gaming was not even possible in medium details and a resolution of 1024x768 pixels with the older Formula 1 simulation F1 2011. The 15.6-incher only rendered 25 fps while Asus' K53SK-SX021V alongside AMD's Radeon HD 7610M accomplished 52 fps. The game recurrently crashed within a short time on maximum details and the Full HD resolution. Consequently, we could not benchmark it. This problem could be related to the new Windows 8 operating system. Older games should generally run smoothly in medium details and a resolution between 1024x800 and 1366x768 pixels. The expectations have to be lowered even more for newer games. Our gaming list provides an overview of which games run on which graphics card. 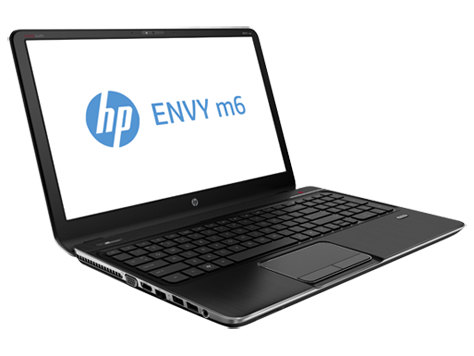 HP's Envy is very quiet in idle mode. We measured a maximum noise of 33.5 dB(A) in our test. The fan remained disabled. The 15.6-incher did not get much louder in DVD playback. We ascertained 32.9 dB(A) here. The fans first start to spin during load. However, only a relatively quiet noise is audible even here. Our maximum ascertained rate was just 37.4 dB(A). We can only congratulate HP for its Envy in this segment. Following the good rates in system noise, we ask ourselves whether the low fan activity affects the laptop's temperature development. HP's CoolSense technology allegedly thwarts a too high temperature on the casing. This is absolutely true for office use. The top reached a maximum of 33.1 °C and the bottom heated up to a maximum of 34.7 °C. 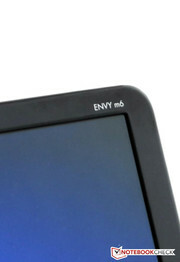 HP's Envy m6-1101sg is completely within the target area. But what about load? We powered the multimedia laptop for several hours in an unrealistic stress test. Furmark and Prime95 ran simultaneously for this test. The casing's temperature naturally increased as time passed. However, the laptop was still fairly cool in most areas even after several hours. For example, the wrist rest reached a maximum of 32.5 °C. The multimedia laptop only surpassed 40 °C at two measuring points. Nevertheless, the results are absolutely satisfactory. HP's CoolSense technology seems to work in this model. We also rechecked the 15.6-incher's performance after the stress test. 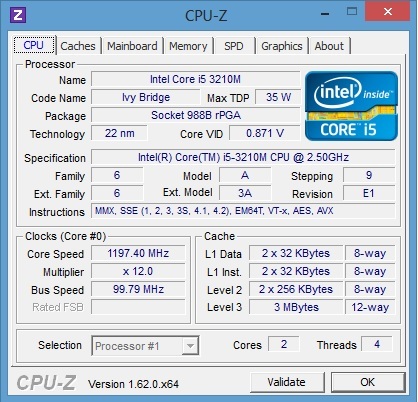 The dual-core processor even ran Turbo Boost with approx. 2.9 GHz during the stress test. We started 3DMark 06 directly after the test. Here, we did not ascertain any major performance differences (8790 vs. 8801 points). 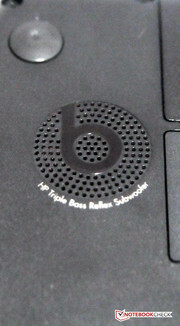 A sound system named Beats Audio is installed in HP's 15.6-inch Envy m6-1101sg. The name sounds promising in any case. Two speakers are located above the keyboard and a subwoofer is found on the multimedia laptop's bottom. The sound-system is very impressive. The sound is good and the bass is perceptible. Even the maximum volume is completely sufficient. However, Asus' N56VZ-S4044V does a better job owing to an external subwoofer, which produces a somewhat better sound. External speakers can be connected via the 3.5 mm audio jack or the HDMI port. The multimedia laptop consumed between 8.8 and 12.3 watts in idle. These rates are within the expected range for a laptop with this configuration. The power consumption quickly increased during load. The 15.6-incher required around 48.4 watts when Furmark and Prime95 ran simultaneously. The system consumed 35 watts when we only ran Prime95. These rates are also good. 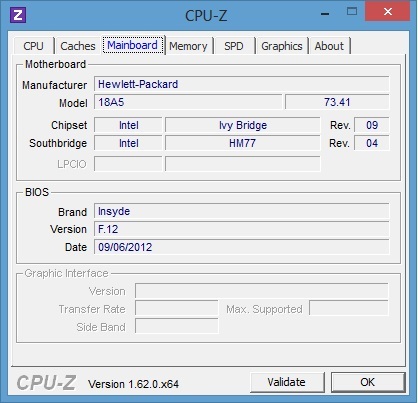 For example, HP's ProBook 6570b using the same CPU but no dedicated graphics card consumed more power during load (54 watts). The included 90 watt power adapter is fully sufficient. Conclusions about the battery runtime can be derived from the power consumption. The second main factor is of course the battery. HP relies on a 6-cell lithium-ion battery with a capacity of 62 Wh in its 15.6-incher. We ascertained the battery's performance in a total of four different scenarios. We first determined the maximum battery runtime using Battery Eater's Reader's test. The multimedia laptop lasted for 6 hours and 40 minutes on minimum performance settings. We wanted to simulate everyday surfing behavior in a more practical test. Here, we enabled Wi-Fi and set the brightness to roughly 150 cd/m². The 6-cell battery lasted for 4 hours and 55 minutes. Playing a DVD in maximum brightness was possible for 4 hours and 14 minutes without the power cord. We again used Battery Eater for the last test, but the Classic test this time. 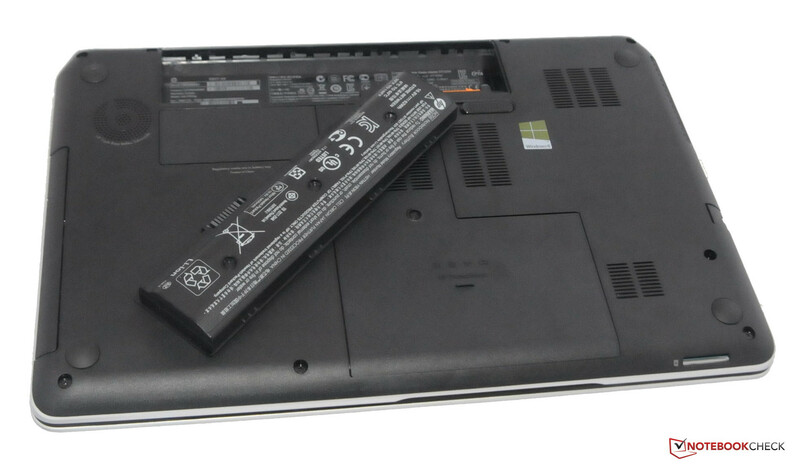 It determines the laptop's battery performance in load. HP's Envy m6-1101sg shutdown after 1 hour and 53 minutes. 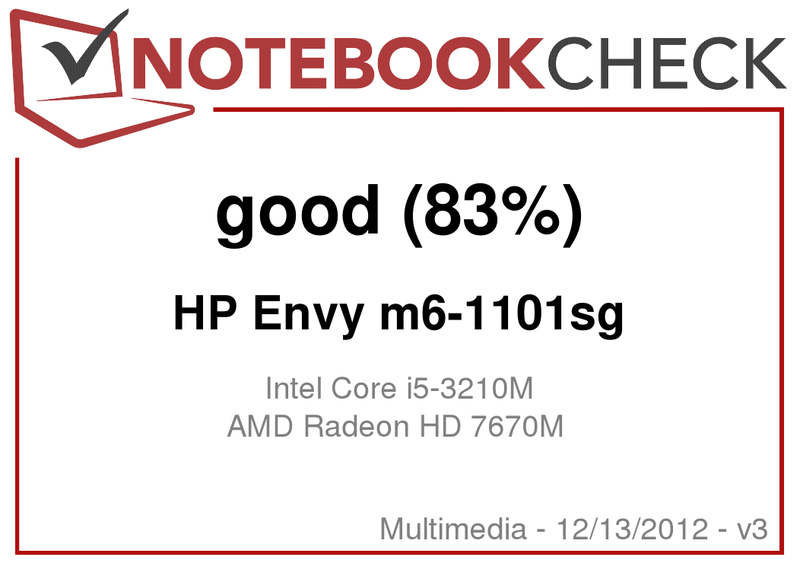 HP's Envy m6-1101sg multimedia laptop exhibits a few strengths. The 15.6-incher in an aluminum casing features a high application performance alongside Intel's dual-core i5-3210M processor. 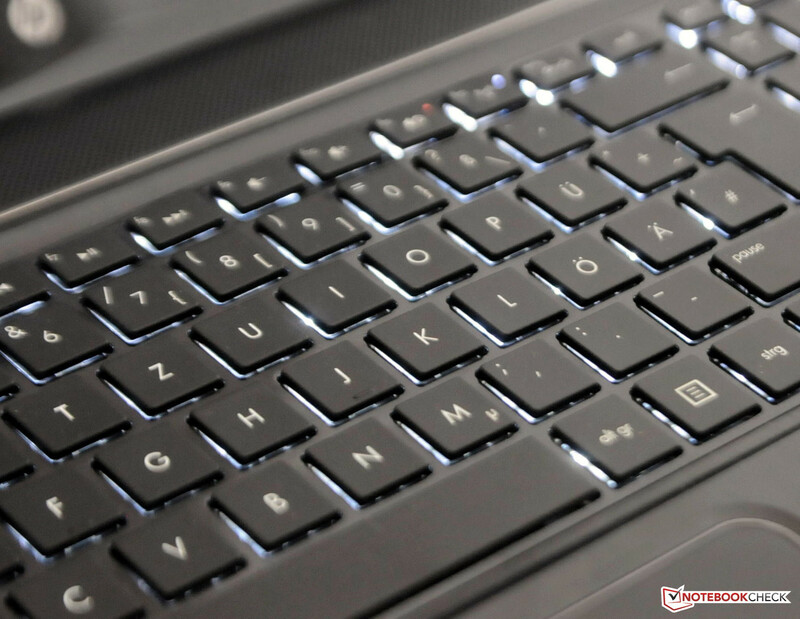 A highlight is the backlit chiclet keyboard. HP's Envy also offers a 1 TB hard drive and a fingerprint reader. The multimedia laptop's noise and temperature development must also be praised. However, we noticed the weak screen adversely. 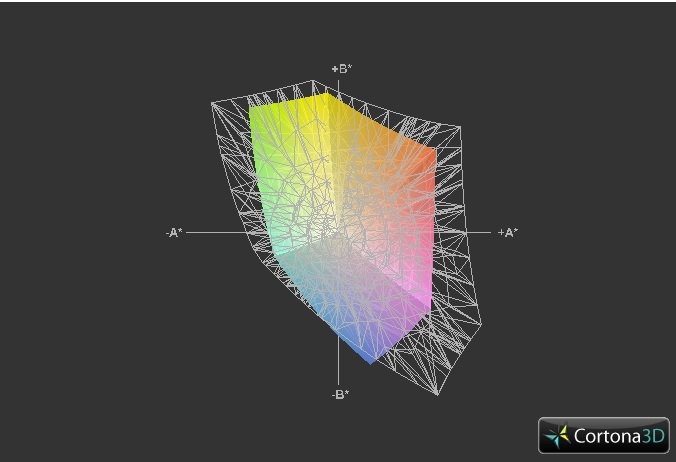 It only manages a maximum resolution of 1366x768 pixels and is not AR coated either. Its brightness is also only middling. Moreover, the keyboard's too small arrow keys did not appeal to us. Besides that, the touchpad presently has a few incompatibilities with Windows 8. 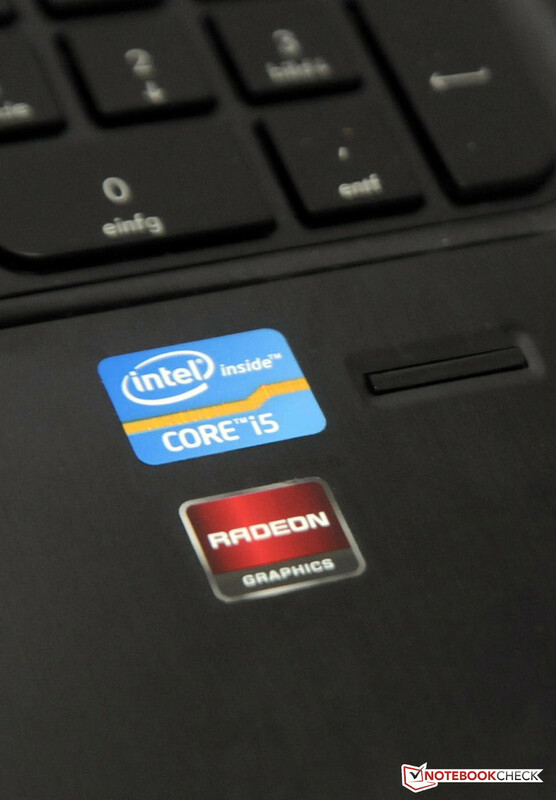 The multimedia laptop's AMD Radeon HD 7670M is only apt for low details and resolutions in up-to-date games. If you have a bit of money to spare you can get a laptop with an AR coated Full HD screen and higher graphics performance in Asus' N56VZ-S4044V for around 1000 Euros (~$1328). Another alternative would be Dell's Inspiron 15R Special Edition for 900 Euros (~$1195). However, it does not feature quite as a good gaming performance with AMD's HD 7730M graphics card as the aforementioned Asus model. HP's Envy m6-1101sg costs around 800 Euros (~$1063). Two speakers are above the keyboard. 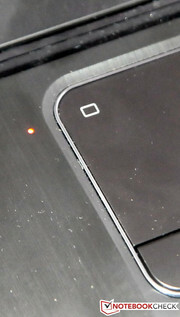 The touchpad can be turned off and on by tapping the rectangular field. HP's Triple Bass subwoofer is on the bottom. LED indicators signal the status of Wi-Fi and other modules. Moreover, the keyboard is backlit. The keyboard features a complete number pad. Two of the four arrow keys are (too) small. A hard drive from Western Digital is used. It offers a storage capacity of 1 TB. 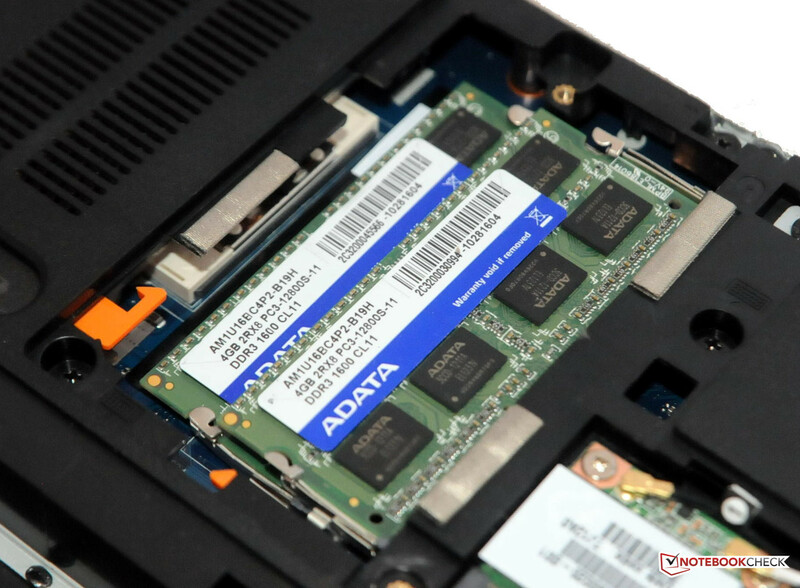 HP installs an 8 GB DDR3 working memory from ADATA. 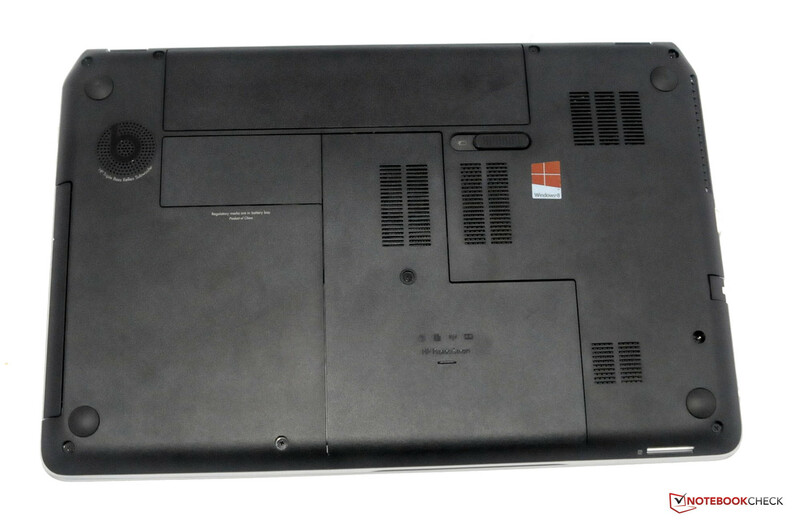 The bottom allows accessing the laptop's innards easily. The 6-cell battery is easy to remove and supplies a capacity of 62 Wh. The 15.6-incher's bottom looks quite rigid. The casing is comprised of aluminum and chrome. The multimedia laptop weighs 2.4 kg. Three fast USB 3.0 ports are available. The buyer gets a 15.6-inch device and a reflective screen. 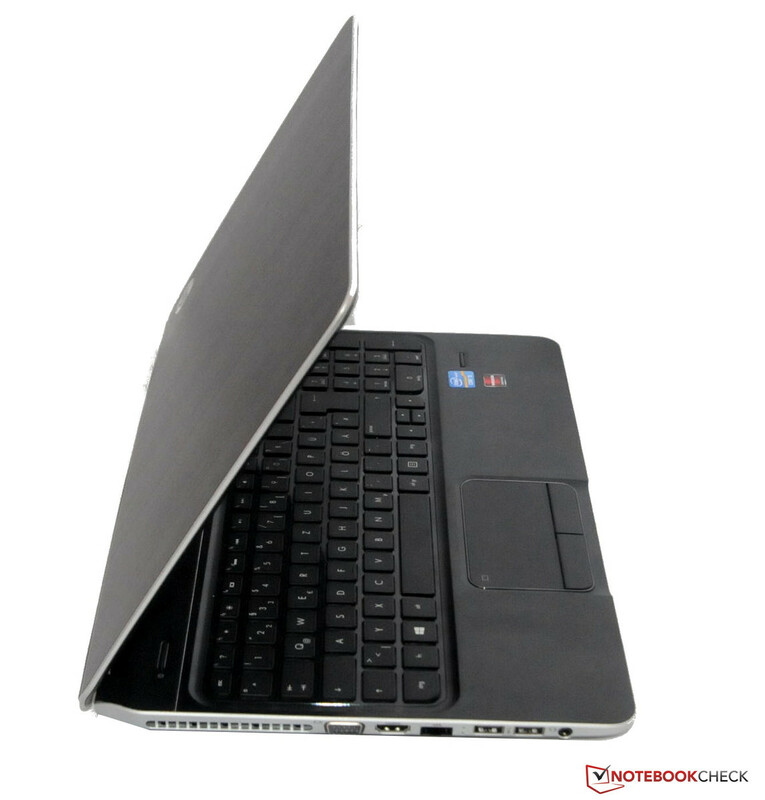 The multimedia laptop is based on Intel's dual-core i5-3210M processor and AMD's Radeon HD 7670M graphics card. The fan's restrained behavior and the temperature development of the 15.6-incher. A brighter and AR-coated screen with a higher resolution. The touchpad's incompatibility with a few applications in Windows 8.